Northeast New Mexico Detention Facility is located in Clayton New Mexico. 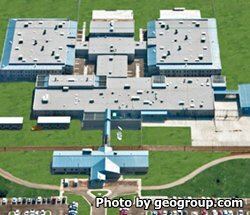 It is a level III medium security facility that is owned by the town of Clayton but operated by a private corporation called The GEO Group, Inc. This facility has a capacity of 625 male inmates. Inmates are secured by two security fences, a microwave intrusion detection system and a 24 hour armed patrol. Offenders are housed in two buildings that are comprised of double cells. An additional county detention area for male and females offenders and an administrative segregation unit is also present at this facility. While incarcerated at Northeast New Mexico Detention Facility, inmates can participate in the prison industries program, work supportive institutional jobs, earn a GED, and receive medical, dental and psychiatric services.